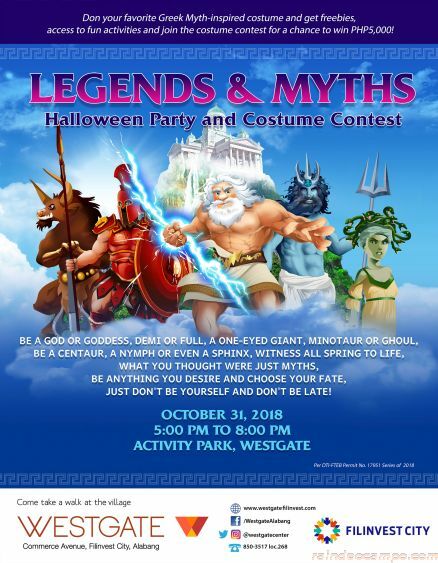 From Zeus to Medusa to a cyclops, a siren, a minotaur, and more, come as your favorite character in Greek mythology at Westgate Center’s Legends & Myths Halloween Party and Costume Contest at the Activity Park, 5 p.m. on Oct. 31. Kids aged four to 11 years old are invited to take charge of their fates and become their favorite mythological creature for an evening filled with fun activities like a magic show, a candy buffet, and a special glitter tattoo session! 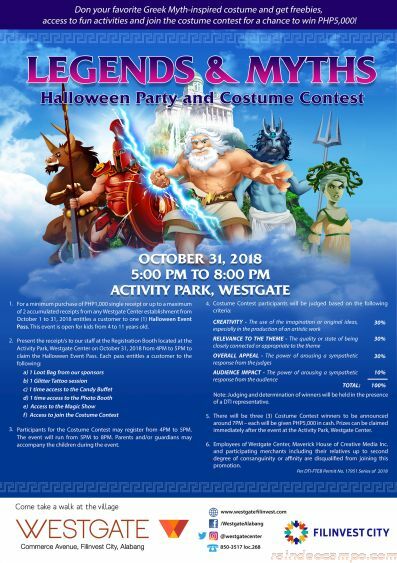 To join the Halloween costume contest, just purchase a minimum of 1,000 Pesos single receipt or two accumulated single receipts from Westgate Center establishments from Oct. 1 to 31 and claim your Halloween Event pass at the Activity Park registration booth on Oct. 31. Three champions with the best Greek Myth-themed costumes will be chosen to receive 5,000 Pesos in cash and be declared the contest winners! Don’t miss the legendary Halloween party only at Westgate, the South’s go-to lifestyle hub!